Have you reserved your Golf Cart Rental? 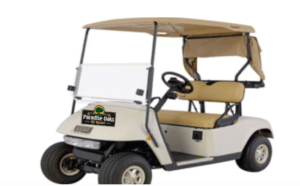 Paradise Oaks has 25 park owned golf carts for rent during your stay at Paradise Oaks RV Resort. With miles of roads to roam, it’s a fun way and convenient way to get around, and…… not worry about parking at activities and events. We have wind/rain protectors, on-staff maintenance and nice and clean carts. Call us today or email us at reservations@paradiseoaksrv.com to reserve yours! Last year they were all rented out, so don’t wait too long! Give us a call or email us to reserve your Paradise Oaks RV Resort Golf Cart! Activities in Motion this Week – Check out our Calendar! New Sites Are Making Progress – have you booked yours?